I hope you’ll keep adding to the list of Christmas memories in the last post. In the meantime, I’ve been challenged to produce proof that our Christmas trees are really up and running. (sigh)…Come, all ye faithless to David’s blog to see the pudding. Click here. Merry Christmas! I thought I’d start the week with something fun. Our church service tonight was different. When sermon time came, our pastor turned it into audience participation. Sunday night services at our church draw a smaller crowd, so this worked well. He asked whomever wanted to share memories of Christmas…whatever we wanted to tell. Many people spoke up. Stories ranged from poignant to funny, and it turned into one of my favorite Christmas services I can remember, despite pricking me with homesickness. Most of the memories came from childhood. It seems like our hearts permanently tuck those away, don’t they? So, I thought we could do the same thing here. Are you up for it? Share whatever Christmas stories you want – funny or serious, or simply something that stuck with you. I’ll start with a few random memories of my own. – When I was really young, Santa set up shop inside a huge snowman near our house. I was fascinated by the whole setup. The snowman sat in a shopping center parking lot, and Santa lived inside with nothing but a chair, noting our dearest wishes for Christmas. You know how as kids things loomed bigger than they were? The snowman had to have been five floors tall to me, but in reality was maybe two. 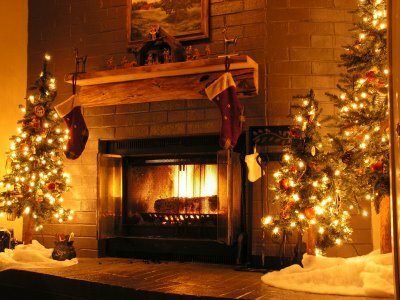 – I loved Christmastime with my family–my parents and older sister. Every year my mom, sister, and I would make Christmas tree cookies with the same Mirro cookie press. The best part was sprinkling candy decorations on each one, making each a unique creation. …A unique creation that was soon gobbled up. My parents gave me my own Mirro press the Christmas I was engaged. I could go on and on, but I’d love to hear from you. What’s your story? I’m all ears. My Christmas tree is missing. My Christmas tree is missing…from our den, that is. I know, I know. I’m in shock myself. It feels almost illegal in Christmasville. Where did the time go? Never in my life have I been treeless this far into the season. We’ve raced through busy schedules this month. I was out of town every weekend, plus we’ve been juggling church activities (David is a minister) plus an unusually heavy workload. Plus a fast-approaching writing deadline. Plus yada yada yada. Many late evenings have found us just getting home then soon dozing on the couch. You can relate, I’m sure. I tried to fancy myself that this is how people in Jane Austen’s day did it; the tree didn’t appear until just before Christmas. (Sigh) No dice. The days flew by, and I got antsy and almost depressed about my bare tree and walls. We love decorating for Christmas: it’s an all-day affair with decorations for each room, most of them sentimental. True, by the end of the day I’m usually tired and grouchy from the mountain of piled boxes (poor David! ), but I wouldn’t dream of it any other way. It says, “Christmas is officially here for the Bryants.” Deep down I’ve believed that a cozy Christmas couldn’t start until the house looked like Christmas. I also love having friends over and sharing the season. By the way, this photo shows our hearth a couple of years ago. Finally, it occurred to me to turn my not-so-quiet desperation into prayers. Seemed kinda silly to pray about decorating. I’ve been reminded by God, though, that I can–and should–turn over all things to Him. Especially if that something was driving me nuts. Slowly God changed my attitude, and something surprising happened: I’m now having one of the best Christmases I can remember! …The pace hasn’t slowed, but I’m less stressed in the midst of the busyness. I’ve decided to simply enjoy. He’s showing me with fresh perspective the preciousness of His coming. My heart is treasuring the words of carols in a more meaningful way. Now, don’t get me wrong. The tree will be up and adorned before Christmas, doggone it. But now it will be done with a quieter heart, relishing the simplicity with which He came for us all. 1. I love climbing things–usually I can’t resist. When I get up really high, though, I’m like a scared kitten in a tree. That still doesn’t stop me most of the time. 2. I often read magazines from back to front. 4. Texas Independence Day is another favorite day and should still be a holiday. Don’t get me started. 5. The Ginger Rogers in me would love to take more ballroom dancing classes. 6. As a three-year-old I ran away from home. 7. I didn’t see “Star Wars” all the way through until I was in college. So there you go. But…I’m adding my own twist. One of these is only partially true. Care to guess? I could tag others, but I’d like to hear from those who don’t necessarily have a blog. I dare you to add your seven things in the comments. And if you do have a blog–and even if you’ve already posted your seven things–add some more here!